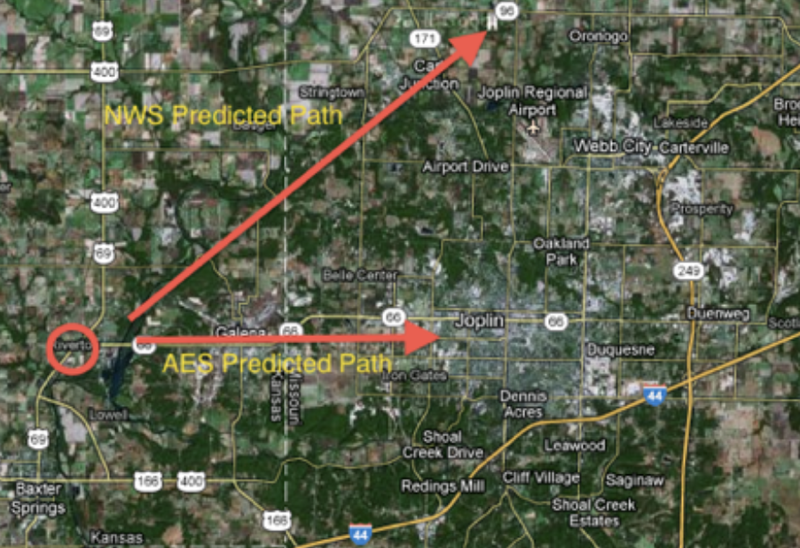 MSE Creative Consulting Blog: "Where Was AccuWeather When 200 and Something Mile Per Hour Winds Were Churning Though An American Town [Joplin], Killing People?!" "Where Was AccuWeather When 200 and Something Mile Per Hour Winds Were Churning Though An American Town [Joplin], Killing People?!" The answer to Michael Lewis' accusatory question in his The Coming Storm is: AccuWeather accurately and explicitly warned its clients in Joplin the tornado was coming in time for them to move people and equipment out of harm's way! That is much more than can be said for the National Weather Service's inadequate performance that terrible day. The citizens of Joplin would have been far better off with AccuWeather's tornado warning on May 22, 2011, than with the National Weather Service's. The tornado killed 161 people. If you wish to hear Michael Lewis (in his own voice) level the false accusation against AccuWeather, it is below. His words are from his political polemic, The Coming Storm, published today. This morning, I posted about the audio book. But, I had not heard the slanderous charge that AccuWeather was not doing its job during the Joplin tornado. The book casts former NOAA Director, Dr. Kathy Sullivan, in the role of hero who was trying to pick up the meteorological pieces after the tornado. However, in Lewis' telling, the reason there was an unprecedented number of deaths was due to the citizens of Joplin not heeding the warning because the warnings were "better than they usually were." Lewis gratuitously casts AccuWeather in the role of devil regarding the tornado -- when the opposite was true. As I indicated in the blog posting below, Mr. Lewis has no commercial meteorology background or knowledge. Apparently, the information he received on the Joplin Tornado came from Sullivan. The issue is that Dr. Sullivan (who is also not a meteorologist) knows better than her contention that the NWS did well that horrible day. How do I know? 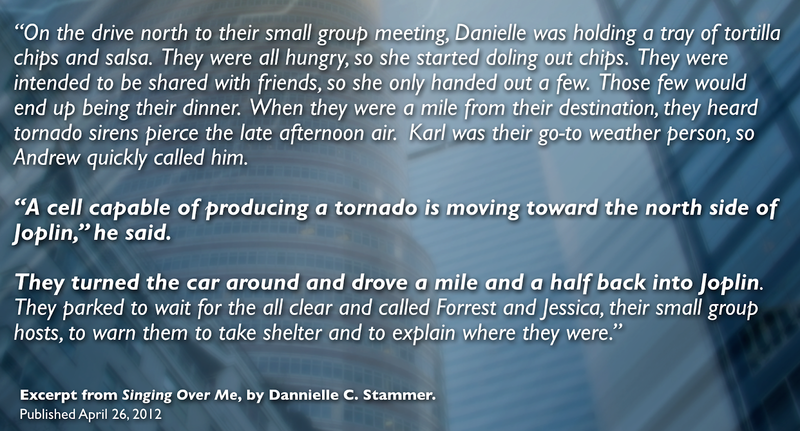 Silent, my book about the Joplin Tornado at a meteorological meeting. this ever happens again" and I signed it. Instead of saying, "thank you," or something similar, she replied, "I've heard about this book! ", grabbed the copy out of my hands and stomped off. So, since Lewis chose to highlight the NWS's supposedly better-than-usual performance and AccuWeather's alleged non-existent performance pertaining to the Joplin Tornado in the book, let's review the NWS's performance and compare it to AccuWeather's. Keep in mind the role of the NWS is to warn the public-at-large and the role of commercial weather companies is to warn their enterprise clientele. If, as Sullivan and Lewis contend, the NWS warning for the Joplin tornado was "better than usual," why did a local National Weather Service employee state one year later (in the Joplin Globe), "Joplin was essentially blindsided by the tornado"? Except the tornado didn't "form over Joplin." That bit of propaganda was developed to shield the NWS from criticism for its lack of effective warning. Before I show you the inaccurate NWS products, let's review the warning as it unfolded on KSNF TV, the NBC affiliate in Joplin. You hear the meteorologist Caitlin McArdle and newscaster Jeremiah Cook speaking very calmly at the beginning. Why? 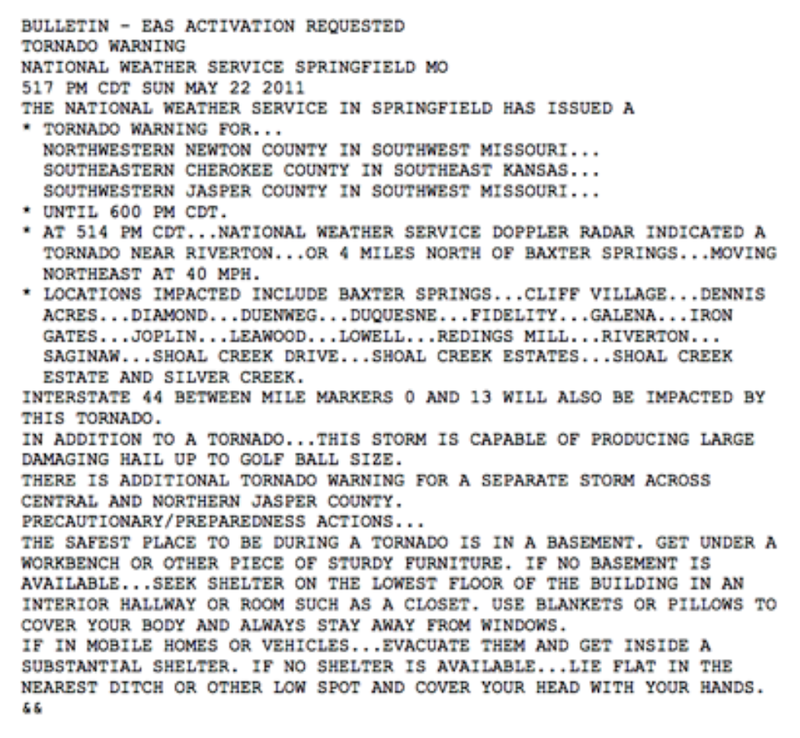 Relying on NWS products, they had no idea the tornado was moving into Joplin. The sirens were not being sounded. Then, Caitlin realizes what the camera is showing in front of her eyes. Her tone and sense of urgency changes instantly. I interviewed Caitlin for When the Sirens Were Silent. She told me she was "shocked" the tornado was coming into Joplin. 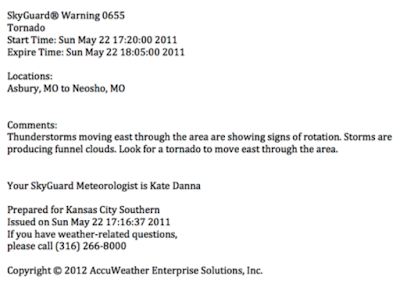 Here is the National Weather Service's attempt to warn Joplin. It was issued at 5:17pm. Please note the NWS says the tornado was "moving northeast at 40 mph." Here is AccuWeather's tornado warning, issued one-minute earlier, for Kansas City Southern Railroad which runs north-south through the center of Joplin. 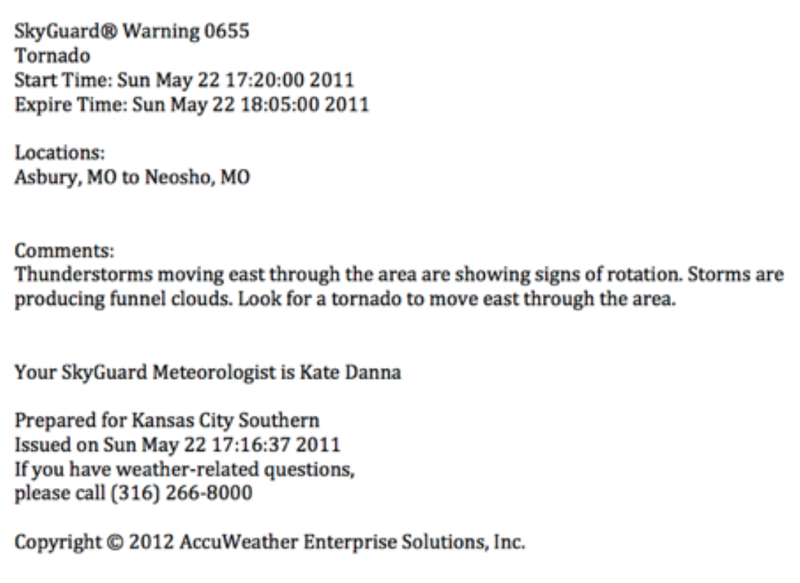 Other Joplin clients received warnings customized for their location and requirements. Note that it says, "Look for a tornado to move east though the area." The difference in those five letters was absolutely critical. The NWS meteorologists reported the storm was moving northeast from Riverton and then Galena, Kansas. A northeast movement misses the city of Joplin! The graphic below illustrates. 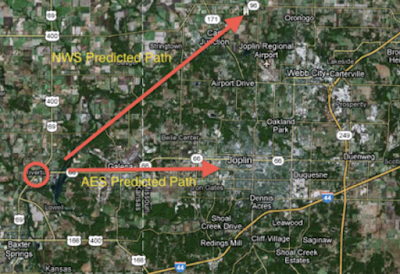 AccuWeather's predicted path was perfect -- across southern Joplin just south of old Highway 66. The diagonal arrow, the NWS's forecast path, missed the city completely. The NWS would go on and repeat its error several more times. When I was interviewing people for Sirens, I was told, over and over, "I thought it was going to miss the city." family had with the tornado. 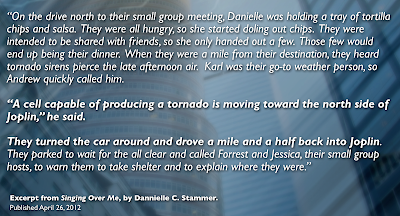 Ms. Stammer's family was perfectly safe but turned the car around and drove back into the path of the tornado (her husband was seriously injured) because they, too, were told the tornado was going north of the city. On the other hand, AccuWeather's clients acted on and used the AW tornado warning. Here is an email from Tom Murphy of RailAmerica, which dispatches the Missouri and Northern Arkansas Railroad -- another railroad that runs through Joplin -- written two days after the tornado. At the time of the Joplin tornado, what has been AccuWeather Enterprise Solutions since August, 2011, was called WeatherData Services, Inc. I can provide much, much more information. If this is topic of further interest, I would like to direct you to When the Sirens Were Silent. counties in their region. The two counties immediately southwest of Joplin are Craig and Ottawa counties in Oklahoma. Their warnings are issued by the NWS in Tulsa. 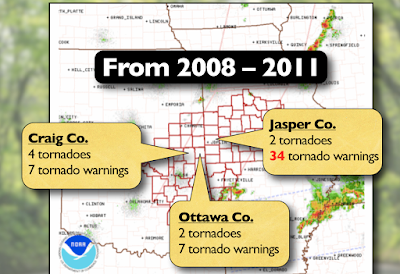 From 2008 to 2011, those counties had just 7 tornado warnings, each. 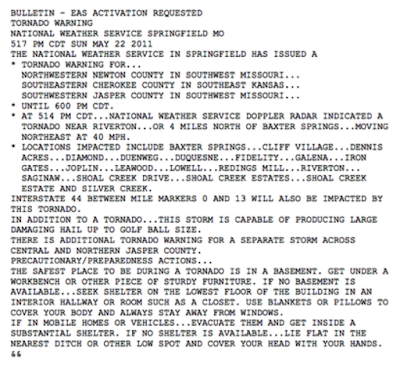 Jasper County (Joplin), Missouri, handled by the Springfield NWS had an incredible 34 tornado warnings! All but two of those were false alarms. 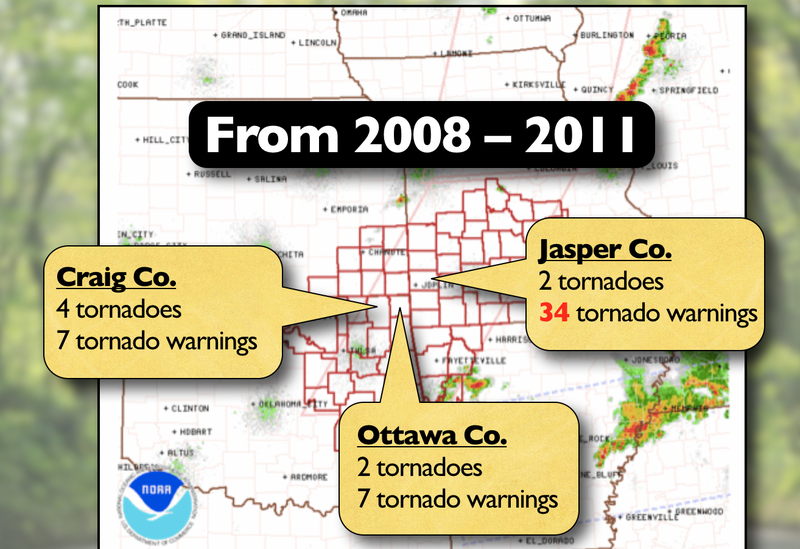 The terrible over-warning had "trained" the people of Joplin not to pay attention to tornado warnings. This, too, is in the book I gave Dr. Sullivan. She also could have learned that herself if she had bothered to research the subject. I retired from AccuWeather in March. I can state that the people of AccuWeather worked extraordinarily hard and with great dedication to provide the finest tornado warnings in the industry -- government or private sector. With Joplin and on so many other occasions, they succeeded. And, as Lewis himself is forced to acknowledge, "at least one" independent study has shown AccuWeather's forecasts to be more accurate than those of the National Weather Service. If it wasn't clear after reading this morning's posting about The Coming Storm, then the details above should remove any doubt: Mr. Lewis' book is a poorly researched polemic apparently designed to derail Barry Myers' nomination to be administrator of NOAA.